It comes to that time of year when the snows and cold weather are gone. You decide it’s time to break out the grill and have a cookout. Apart from checking you have enough gas or coals, what else might you consider? There are many accessories available on the market for your grill. A lot of these will make life easier and enhance your grilling experience. However, which of the gadgets you can buy are considered essential? Let’s look at 10 pieces of equipment that we think will make your grilling experience better. This is fundamentally more than one item. However, they all have their uses. These individual items can bought as a stand-alone or as a set. Tongs will enable you to turn your meat without piercing it. This means all the juices and flavor will won’t drip out, keeping it moist and tasty. Opt for long handled styles, which lessen the risk of burnt fingers. Also consider stainless-steel as a preference, for ease of cleaning and durability. A spatula is a must for flipping burgers or sliding under a delicate fillet of fish. Some have handles which are offset making them easier to use. Heat resistant silicone or metal and—again—a long handle, will work best. A heat resistant basting brush will make easy work of brushing on marinades or sauces during grilling. Forks have their place when it comes to essentials tools. They help hold a burger in place when flipping it, making sure it doesn’t fall between the grill plate. They can also be used to gently pierce food to check if it’s cooked. Gently press on the pierced meat with the back of the fork to see if the juices are running clear. There are single tools that combine a fork, spatula and tongs, as well as other utensils, like a bottle opener or flashlight. There are two types of thermometer used when grilling. A grill thermometer registers the temperature of the internal cooking grate. An internal or meat thermometer uses a probe to indicate the temperature inside the meat. Both thermometers take the guesswork out of making sure your food is properly cooked and safe to eat. Many grills now come fitted with an external/grill thermometer. If yours doesn’t, there are some available which can be easily installed. Some internal or meat thermometers can be left inside the meat as it cooks. This is particularly good for large roasts. Others are used to probe smaller items, like burgers or steaks, to check whether they are ready. There are many models available, from a basic probe to a wireless gauge that lets you set timers. Some even have alarms when the required temperature is reached, or a set cooking time finishes. The temperature displays should be clear and easy to read. They might show on an LCD display or be analog. Whichever meat thermometer you choose, make sure they can read the temperature in just a few seconds. After all, an extra minute or two can make the difference between a perfectly cooked steak or one that's overdone. If you’re using a charcoal grill, getting your coals alight can be a bit of a nightmare. The last thing you want is for them to burst into flames, taking off your eyebrows. The caveman in you might consider rubbing a few sticks together, or banging a few rocks to try and create a spark. I think we all know that’s not going to work. Long handled lighters are the best idea as they keep your hands, and hair, out of harm’s way. You can also buy longer length matches. These give you a better safety margin than standard length ones. The addition of some good old fashioned firestarter cubes can ensure success. You can also use an electric coil style lighter to fire up your coals. Be aware, however, that this type of lighter is not advised for coals soaked in lighter fuel. One of the latest tools to emerge on the market is one that uses hot air to fire up your coals. Once plugged into an electric socket, switch it on, then place the nose of the appliance against your coals, and wait. Within minutes the air stream will have your coals alight. These are generally referred to as a Looftlighter, although this is a brand name. There are similar lighters available from other makers. Some can reach temperatures of over one thousand degrees Fahrenheit. Another option is using a propane fueled blow torch to get your coals going. Some might think this makes you look quite the professional grill master, but they are quite easy to use. They are also effective in lighting your coals. There is one device available from Bison which combines an air lighter with a flame. It’s a rechargeable unit that lights the coals using propane, in the same way as a blow torch. It then uses the hot air blower to fan the flames. Lighters are also available for your gas grills. They are often long handled and have a flexible arm which can be positioned so you don’t burn your fingers. Generally battery operated, they create a spark which ignites the gas. Some such as the Saberlight Flex use a very hot plasma beam to light the gas. These type of lighters don’t use any butane and many have safety child locks. Again, for the charcoal grills, this hollow metal cylinder gets your coals burning hotter, quicker. It has holes at either end for airflow and a wire grate at the bottom. Simply fill it with coals, set it over some lit firestarter cubes on the grill, and wait. It doesn’t take long, in about 15 minutes the top coals will start to turn from glowing red to gray with some ash. Use the handles provided to pour the hot charcoal into the grill. Arrange your coals, close the lid. Give it about another ten minutes to get up to temperature, and start cooking. Just make sure you put the hot chimney out of harm's way until it cools down. It’s not always the case, but there will be times when you are grilling after dark. Once the sun goes down you need to consider how you are going to see what you're cooking. Apart from that, not being able to see what you’re doing can be dangerous. You could use a flashlight to see your way in the dark, but this leaves you with only one free hand. Other options available include lights with a clamp, or those worn on the head. The lights with clamps can be attached onto the handle of the grill, or to a side table. They have a swivel arm and can be moved to illuminate the area you want to see. Some have goosenecks to position the beam for optimum vision. Headlamps are a good option if your grill is away from the home, or when you are camping. Leaving both hands free, they will light your way to and from the grill. They are also powerful enough to give you perfect vision to check if your food is properly cooked. Another novel way of adding light is provided by Grillight. They make grill tools with an LED light built into the handles. If you don't want to lose your fish or other smaller items of food through the grill rack, then a grill basket is a must. These baskets allow your food to be held firmly inside them. They have a top and a bottom which lock together, with the food sandwiched in the middle. You can buy individual ones for all different types of food. There are some which are fish shaped and some designed for sliced vegetables. Others are available for fruit and even for meatballs. You can also get a multi-purpose basket which will cover all eventualities. Marinating meat for the grill can be a lengthy task. Even after hours of soaking, it might only tenderize the exterior of your roast or steaks. A meat injector kit will let you get all that moisture, and flavor, right to the core of your meat. They are easy to use and reduce the grilling time for large cuts of meat. The device resembles a huge syringe with a needle. You simply choose your marinade, or it could be some wine or melted butter. You might even have a favorite spicy sauce. Your marinade is drawn into the syringe using a plunger. When it’s full, put the needle into your meat and depress the plunger. Your marinade or flavoring will disperse within the meat. This gives you flavor and juiciness with every bite. Make sure you choose an injector kit which is suitable for the job. Most are made from food grade stainless-steel. They often have a choice of needles for different types of liquids. Some are also supplied with spare O-rings and cleaning brushes. I dare say we have all seen the jokers at the grill wearing a flimsy, plastic, novelty apron. They might have a perfect set of abs, until the apron comes off. While good for a laugh, these are not practical, or safe, when working over a hot grill. Grilling can be a messy business. Whether its handling coals, basting meat with marinades, or the occasional piece of spitting fat, you need protection. A good apron will protect you, keep your clothes clean and your partner happy when it comes to doing the laundry. The best option is to choose a heavy-duty cotton, denim or waxed canvas apron. 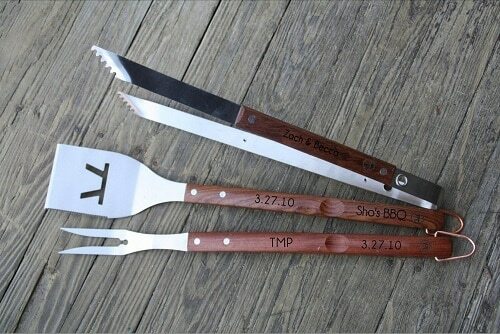 There are many which have handy pockets you can place your grill tools in. This is also a good place to keep the bottle opener; these always seem to get lost. The oven gloves used in the kitchen just won’t cut it for the grill. They aren’t thick enough or long enough and won’t give you the protection needed. After all, that grill can get pretty hot. Trying to reposition a piece of meat over a flaming hot grill wearing the wrong gloves is likely to be something you will only do once. A good quality pair of cooking gloves will protect your hands from the heat, and make sure you don’t get burnt. There are several materials used to make grill gloves; the options below are the most useful, depending on the task. Silicone gloves are perfect for protection from hot liquids or handling hot meat. Kevlar and Nomex are better for handling and repositioning hot coals, grill plates and dry items. They often have silicone added for a good grip. Leather will also be good for moving hot objects when they are dry. Gloves are inexpensive enough to have two pairs, one set for dry and one for wet. Another consideration when choosing grill gloves is their flexibility. You still want to be able to hold your grilling tools firmly. Finally, think about your arms. Make sure to choose grill gloves that cover the lower arms, this means less singed hair or burnt wrists. Cooking all that delicious food over a hot grill will leave it in need of a good clean. A good quality grill brush can take the hard work out of his task. Grill brushes can have copper, stainless steel or nylon bristles. Just remember that some bristles can shed and get stuck on food. This can be potentially dangerous if they are ingested. Make sure that no bristles are remaining before you next use the grill. Another consideration is the material your grill grates are made from. Some brushes can damage the coating on porcelain coated grates, for example. Check your grill manufacturer’s recommendations. There are many different shapes, sizes and types of grill brush. Some come with a reservoir of water to create steam such as the Grill Daddy Pro. There are even automatic robot grill brushes. Remember, cleaning the grill grates should be done when it’s warm. This makes it much easier than trying to scrape off cold grease and food remains. It’s your choice: the grill can be cleaned before cooking, but after the grill has warmed up. Alternatively, the grates can be cleaned afterward, again while the grill is still warm. There are so many accessories for your grill, making a choice what to buy can be a time-consuming task. Once you have been bitten by the grilling bug, you will yearn for the best equipment. You will want perfectly cooked food, prepared and served safely every time. If your wallet allows, you could splurge on all the equipment at once. All the items we have detailed will greatly enhance your grilling experience. They will make your life easier, and be the envy of your friends. Grilling is fun and rewarding. There is nothing better than seeing family and friends enjoy food you have prepared. Let’s be honest here, we all enjoy a gadget to play with. However, practicality and safety are key factors when choosing essential grilling equipment.